Achim and Conny have been part of some wonderful spiritual journeys with couples in Germany using Gemeinsam ( German Together resource). They saw some couples taking new steps in their relationships, some travelling into marriage and two men journeying to find Jesus! Gemeinsam is a couple’s resource which combines practical relationship tools with Bible study on marriage. 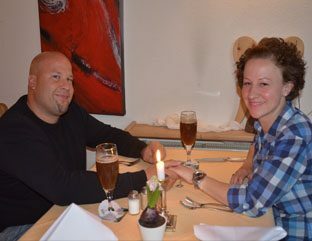 Achim and Conny opened their home and provided a relaxed atmosphere and a meal so that couples could get to know each other. Then over coffee they would look at the material together, discussing a different topic at each meeting. In between the group meetings couples talked about more private issues and applied what was relevant for them. Their second group was a follow-up to a one day marriage seminar they had helped to organise. Part of this group were Stefan and Petra, and Matthias and Yvonne (couple in the photo). Stefan and Petra were both divorced and had been living together for a year. At the seminar Stefan decided to pray and ask Jesus into his life. Conny told us: “Then at another prayer seminar in our church God had powerfully spoken right into his new situation. They both are now so active in church and very, very happy about his new life in Christ. They even led the topic on conflict during the group.” Their story doesn’t end there because in August Stefan and Petra got engaged! Matthias and Yvonne’s spiritual journey continued significantly three weeks later when they met and prayed with the Pastor of the church they had been going to. Three weeks after that he was baptized! You can find out more about the Together resource HERE.